« ‘Post-Brexit summit could pave way for European army’ or is it ‘laughable’? WASHINGTON (Reuters) – Republican presidential candidate Donald Trump said on Monday that U.S. Federal Reserve Chair Janet Yellen was keeping interest rates low because of political pressure from the Obama administration, questioning the motives of an institution whose work hinges on maintaining its independence. “Well, it’s [the interest rate] staying at zero because she’s obviously political and she’s doing what Obama wants her to do,” Trump told CNBC in a phone interview, saying Yellen should be “ashamed” of what she was doing to the country. The U.S. central bank has raised interest rates just once since cutting them to zero in response to the 2008 financial crisis. The Fed has indicated it is preparing for a second hike of 0.25 percentage point, although it has signalled the pace of future rate rises will be slower than in the past. “Any increase at all will be a very, very small increase because they want to keep the market up so Obama goes out and let the new guy…raise interest rates…and watch what happens in the stock market,” Trump said. He did not specify how the Democratic president had put pressure on Yellen. Minneapolis Fed President Neel Kashkari wants us to believe that the Fed is not a political entity. Again, there was no real justifiable reason for the Fed to launch another QE program, let alone an open ended one. This was a clear gift from a Fed Chairman to a sitting President regardless of political party affiliation. Today the politicization is even more obvious. We have Fed Governors openly contributing to Presidential candidate’s campaigns. And Janet Yellen met privately with President Obama in April 2016. Janet Yellen had hinted about raising interest rates last December, but as of this instant, still has not done so. She knows that it would be safer for the economy to do so (see http://www.nbcnews.com/business/economy/feds-yellen-testifies-economy-strong-enough-handle-rate-hike-n473756). I do not believe that the Federal Reserve is immune from doing so as well. 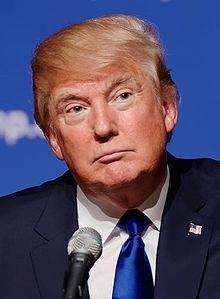 While, publicly the Federal Reserve has not voiced a presidential candidate preference, one would think that with Donald Trump’s occasional anti-Wall Street rhetoric, that they may not want him elected (Hillary Clinton, too, has made anti-Wall Street rhetoric, but her history of financial ties to Wall Street have made many consider that she is much more likely to support Wall Street views than Donald Trump). This entry was posted on Tuesday, September 13th, 2016 at 2:30 pm	and is filed under Prophecy.